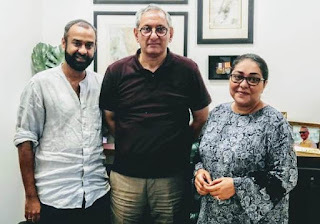 Mumbai, Aug 6, 2018: Anil D. Ambani owned Reliance Entertainment’s Phantom Films and noted young director, Meghna Gulzar have signed up to produce a series on the life and case files of the highly regarded top cop, and former Commissioner of Police, Mumbai, Rakesh Maria. The series will be based on his experiences and various case files of his accomplished career, and will be directed by MeghnaGulzar. Rakesh Maria, an IPS officer, cleared his Civil Service Examination from the 1981 batch. As Deputy Commissioner Police (Traffic) in 1993, he cracked the Bombay serial blasts case, and later moved to DCP (Crime) and then Joint Commissioner of Police (Crime), of the Mumbai Police. Maria solved the 2003 Gateway of India and Zaveri Bazaar twin blasts case. Maria was also given the responsibility of investigating the 26/11 Mumbai attacks in 2008 and interrogated AjmalKasab, the only terrorist captured alive, and successfully investigated the case. Meghna’s 2015 film Talvar released to rave reviews and tremendous audience appreciation. This was followed by her latest feature film Raazi, released in May, 2018, which also received critical acclaim and was a huge commercial success, earning big numbers at the box office. The series is being packaged by KWAN.